Hard boiled eggs are my favorite thing to cook in the Instant Pot! 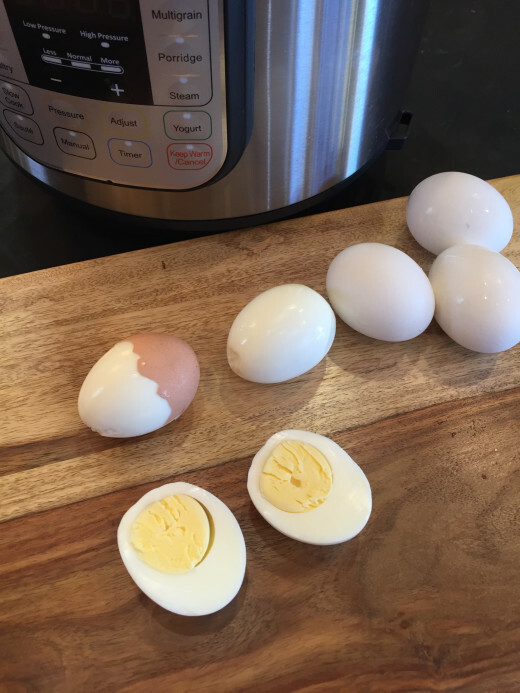 If you have an Instant Pot and haven’t tried Instant Pot hard boiled eggs you need. Really you need to! Before I had an Instant Pot I kept hearing how good hard boiled eggs were when cooked in it. I always thought really what could be that great about eggs in the Instant Pot. They are just eggs. Now that I have tried it though, I totally agree. They are the best boiled eggs ever! It took a little trial and error for me to get them just the way we like them, but once I got the time down right, we love them! Love them! They are perfect every time. They also peel great. I have not had a problem peeling them since I started cooking them this way. Even farm fresh eggs, that usually don’t work well for hard boiled eggs, peel great. Even my kids can’t believe how great they peel. We all love them. Now you are probably wondering how I cooked them. I simply placed the rack that came with my Instant Pot in the bottom of the pot. Added water, put the eggs in, and cooked them for 5 minutes. The exact directions are below. Here is the thing on the time though. I don’t like green yolks. I don’t like green yolks at all. Many of the recipes and times I tried gave me green yolks. Some people say they take 6 minutes to cook. Some say they take 7 minutes. Some said to do the natural release. With all those ways I got green yolks. I like them best cooked for 5 minutes. Then I release the pressure, take the eggs out and put them in a bowl of ice water. I let them cool in the ice water and then I peel them. This gives me eggs just how we like them every time. The eggs in the picture at the top were cooked for 5 minutes. I have been cooking them this way about once a week for quite some time now and it works every time. You might need to adjust the time a little bit depending on how you like them. So try it with a few eggs and see. My suggestion is don’t start with cooking a whole dozen. Try it with 4 or 5 eggs the first time and see what you think. Adjust the time if you want them cooked a little longer. But like I said, I think 5 minutes gives you perfect eggs. 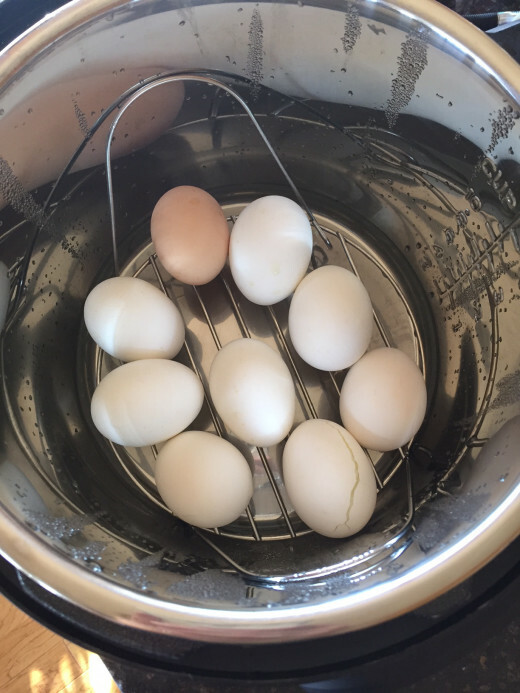 Now if you have an Instant Pot go cook some hard boiled eggs! Be sure to check out my list of Instant Pot Recipes. It is a huge list and I keep updating it to add more! Place the rack that came with the Instant Pot in the bottom of the pot. Pour 1 cup of water into pot. Place lid on Instant Pot and lock into place. Be sure the valve is set to sealing. Carefully remove eggs and place in ice water. For soft boiled runny yolks, use same procedure but set time for 3 minutes. My new favorite breakfast with a thin slice of black forest ham on toast! We love soft boiled eggs and I keep meaning to try it, but haven’t yet. I need to though! Do you use high pressure or low pressure? I’m very happy with my Instant Pot. I did black-eyed peas on New Year’s Day and spaghetti just a couple days ago. I was afraid the spaghetti would turn out mushy or all clumped together, so it was a very nice surprise when it came out just right. As soon as I find the right beef stew recipe, that will be my next Instant Pot meal. I do manual set for 5 minutes and high pressure. I have tried stew in it, but need to adjust it a little before I share it. Look for it coming sometime soon thought. Do you have any idea how many eggs you can hard boil at one time? Sometimes for big family dinners I like to make deviled eggs. I have done a dozen at one time. I think you could do even more than that, but I have not tried it. I hope that helps. I’ve heard the trick to preventing the green hue is to cool them right away in ice water. Since I’ve been doing that, I’ve never had greenish yolks. Thank you so much for sharing your recipes and tips for free! I visited the pizza site that was mentioned but that site charges $33 per year for recipes. I appreciate your site so much! You truly understand how hard it can be for someone trying to convert a life to gluten free, dairy free, acid free, etc. THANK YOU AGAIN! I cook mine for 6 minutes on LOW and they are perfect every time. Quick release, ice water, peel and enjoy. I just tried it at 5 minutes and the yolks were runny. I am sorry. 5 minutes work for me in my Instant Pot. If they were slightly runny I would just do 6 minutes next time. On the tuna fish salad, you mentioned that your husband always had hard boiled eggs in it, yes I do that too. Yes, my husband loves egg in his tuna sandwiches. I didn’t grow up eating it that way, but several of my kids now like eggs in their tuna so I often fix them that way. I think tuna and eggs might be a regional thing, but I could be wrong.